This beautiful coast rarely sees visitors. North Bay is definitely the nicest beach on Salt Cay. A few rock break up the perfect sand in places, but they don’t detract from the natural beauty. Some decent little reefs can be found close off the coast. North Bay is the best beach on Salt Cay. 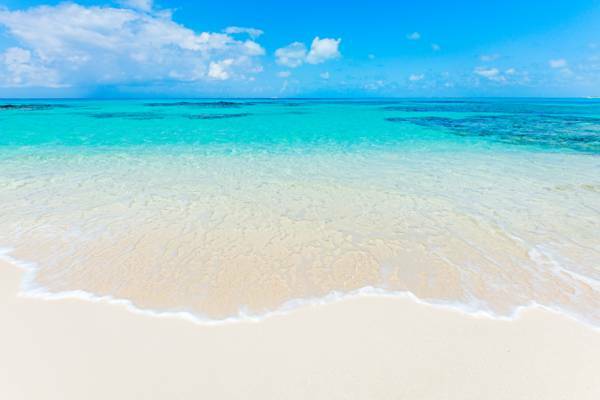 Found off the North Coast, this 1.75 mile (2.8km) is the largest and by far the best beach on Salt Cay. A few coral heads can be found in the water here, but much of the coastline offers a clean sandy bottom and pristine beach. A few vacation rental villas are located on this scenic beach. 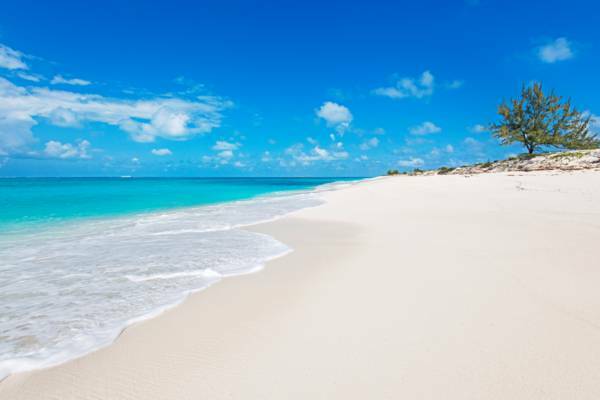 Due to being on the north side of Salt Cay, this beach is usually sheltered from the ocean swells caused by the eastern trade winds. During the winter whale season, it's possible to see humpback whales off the northern coast (but you'll need to take a dedicated whale-watching trip to get the best view). Although there are no dedicated public accesses to this beach, the area has very little development and many paths to the coast can be found. Grand Turk can be seen on the horizon from this coast, and on most days, cruise ships can be seen in the distance going through the Columbus Passage between the Turks Islands and the Caicos Islands. Reefs off the beach at North Bay. Small and distinct reefs, excellent for snorkelling, are found at several spots over the North Bay coastline. North West Point, the section of North Bay nearest Balfour Town and Little Bluff Lookout, offers the finest underwater sights. Ocean surface conditions can be a little choppy at times due to the eastern trade winds, visibility is however typically quite good. To find a site, simply look for one of the darker patches off the beach. It’s easy to see the reefs from on shore against the clean sandy bottom. The reefs off North Bay Beach feature a beautiful combination of yellow sea fans, fire coral, and leafy stinging coral, and schools of bluehead wrasse, French grunts, parrotfish, and blue tangs. Queen triggerfish, black durgons and angelfish can be seen gliding by as well. The larger creatures include the occasional barracuda, southern brown stingrays, and spotted eagle rays. There are two ways to get to North Bay Beach, traveling by road (follow the road that heads north 660ft (200m) west of the airport), or by taking a scenic 1 mile (1.65km) walk along the coast from Balfour Town. There’s lots to explore, so take plenty of drinking water. When driving, take the north turn off of the road between North District and the Salt Cay Airport. This road leads straight for 1500 feet (440m), then arrivals at a T junction with a road that parallels North Bay. At this point, simply pick a beach path that looks appealing. The hiking path from Balfour Town leads along an incredibly scenic route, which leads along Balfour Town Beach, Little Bluff Lookout, and through costal vegetation, at which point it reaches the western side of North Bay.